Corky's BBQ, a Memphis-based chain, is looking to TX for expansion. A franchisee wants to open as many as 17 locations in Houston and Dallas. The article is not specific on how many of those will be coming to Dallas, nor when. The parent of Golden Chick is acquiring a majority stake in Fireside Pies, and wants to expand their presence here. Coney Island Hot Weiner Shop, a Tulsa-based chain, is coming to Rockwall in August as well as Allen this year after the Rockwall location opens. I'm not a vegetarian, but I sure would appreciate more non-meat meal options. cool new restaurant that has piqued the interest of its East Dallas neighborhood is ready to throw open the doors. Called Local Traveler, it's an upscale-casual restaurant serving dinner seven nights a week, that'll be both bicycle-friendly and chef-driven. LiftOff Coffee & Tea is a new venture opening here inside several Walmart stores. There are counters open in Garland and Mansfield now, with more to come in Bedford, Carrollton, Gainesville, and Rockwall. LiftOff's coffee is draft-style -- no espresso machines. The coffee starts out as roasted beans, but before the store level it is processed as an extract; when a barista starts a customer's order, the extract is accessed by way of taps (similar to beer taps). As with other previous restaurant concepts introduced by other companies, LiftOff chose the DFW area to see how customers would like the product, before spreading it elsewhere. Should be interesting to see how this coffee product is compared to the traditional process most customers are familiar with. Coney Island Hot Weiner Shop, Tulsa-based for several decades but originally from the NYC area, is coming to Rockwall next month, Allen in April, and locations later this year in Arlington, Grand Prairie, and Irving. Seems like this would be a great place downtown. Glad to see hot dogs making their way into the N. Texas market. There were quite a few hot dog joints from back in my so-cal days that were quite awesome. I suspect they could do well here as well. I wonder how this new restaurant will fare considering the past couple of restaurants didn't seem to last too long here. Has anyone been to Circo on McKinney? I drive by there and never see anyone in there almost looks closed. The reviews have been pretty brutal. The building and that restaurant seem very out of place looks more like Miami than Dallas. I usually see people in there but it's definitely not "hopping." Assuming they survive their reviews, this should improve some when it warms up and the patio and rooftop portions of the venue open up. Re. the building itself, I know what you mean but based on some of the recent renderings we've seen I expect this is how many more of the upcoming buildings will start to look. A broader observation though is how dead ALL of McKinney Ave is now. There are islands of activity here and there but it's nothing like it was just a few years ago. It's as if the empty-nesters chased out the partygoers, sending them scurrying to Lower Greenville, Henderson Ave, and/or Deep Ellum. ^Thank Goodness from whom all blessings flow Uptown was not shackled by special use permit zoning. Now if we can only get remove the SUP currently shackling Deep Ellum, the city will be able to breath, new life. Isn't there still a rule that tattoo parlors must be at least 1,000 apart? Stupid ignorant municipal approach to governing Deep Ellum is what ruined the party in the 90s -- shifting the raucous crowd to McKinney Avenue. Now that Deep Ellum is a scene again, the city absolutely must accept its responsibility and install a policing policy that protects people while they're intoxicated in public. If someone is just too drunk that they are a danger to themselves, let them pay for a night in the drunk tank -- but do not charge them with a crime! If people are smoking a joint in the alleyway, shew them along before a crowd begins to gather. Let adults party, and make sure they are safe from those who would try to steal from them. And for heaven's sake, allow dancing within the city after 4:00am. But absolutely, do not allow 18+ clubs. Agreed tamtagon! I mean really. It’s not the 1800s. Now will you please mosey on down to city hall and tell them how to start being a real city. I, for one, would appreciate it. Despite the headline, Mutts isn't leaving its Uptown spot, but is franchising the concept to other markets, including Austin. While it's nice to see local establishments see enough success and gain enough popularity to warrant multiple locations, it certainly is making the major cities in Texas more and more homogeneous. Stuff like this seems to be happening all the time. Off the top of my head, I know Nickel City from Austin just announced an expansion to Fort Worth, and Tipsy Alchemist from Uptown is headed to Austin. For me personally, I think it's truly strange that the nightlife scene has started making their establishments chains. That was basically unheard of about a decade ago. A new location of New York burger chain Shake Shack is opening, which is almost starting not to be news anymore, except in this situation, it is because of the location: in Dallas' Old Town center east of US 75. According to a release, the restaurant will open later in 2019 at 5500 Greenville Ave, #505, IE the former Fuddrucker's space, which got nudged out of its space in September 2018. Trading out one burger for another. Personally, I think the place is overrated (considering the price), but it's pretty popular, and this will be an improvement for the area. After months in the works, there's a new tenant ready to open in the former Blind Butcher space at 1919 Greenville Ave. Called Alamo Club, it's an upscale neighborhood restaurant and bar serving American classics in what a release describes as an old-school comfortable setting. Let's see how this new place fares. It does seem like there is a lot of demand for dining in the Lower Greenville area, but I think the lack of parking might turn people off, and that's why we have seen some places struggle. I'm not advocating for more parking, but, if the area lacks in parking, it should really make up for it in density and also be easy to access via bike, DART, etc.. I don't think Lower Greenville is quite there yet, but hopefully as Ross Ave. develops more, it'll put more people within walking/biking distance. I don't know if this was posted, but Tacos Mariachi seems to have added a second location in the former Crisp Salad spot on Lower Greenville. I've been to the one in West Dallas and they have solid, authentic Tex-Mex breakfast tacos and burritos. None of that Tacodeli type nonsense. Matt777 wrote: I don't know if this was posted, but Tacos Mariachi seems to have added a second location in the former Crisp Salad spot on Lower Greenville. I've been to the one in West Dallas and they have solid, authentic Tex-Mex breakfast tacos and burritos. None of that Tacodeli type nonsense. They been there months now. Someone finally signed a lease to take over the aborted Oven & Cellar restaurant at Titche's/1900 Elm. Looks like it'll serve Italian under the name Partenope Ristorante. End spaces still sit empty, although I see events held there occasionally. I'm excited to see Mixt because I moved here from the East Coast and as a basic, stereotypical urban Millennial, I'm in severe Sweetgreen withdrawal. I have yet to have a bad meal in Dallas, but the upscale, very healthy, salad-with-unique-ingredients trend has yet to hit here (Crisp on Lower Greenville hewed more to the Cobb, Caesar, and Southwest corner of salad culture. Flower Child is great, but not accessible from the urban core.) This is filling a niche for office workers who want something for lunch that won't cause them to fall asleep at the keyboard by 3pm. emmasensei wrote: I'm excited to see Mixt because I moved here from the East Coast and as a basic, stereotypical urban Millennial, I'm in severe Sweetgreen withdrawal. It seems like there were a number of "upscale, very healthy, salad-with-unique-ingredients" spots in Dallas 10-15 years ago, but for a variety of reasons they're no longer around (e.g., Cafe Express). Though it's not a sit-down restaurant, my lunchtime salad go-to is still Eatzi's. Last edited by eburress on 26 Feb 2019 13:23, edited 1 time in total. emmasensei wrote: Flower Child is great, but not accessible from the urban core. Don't forget, but Flower Child is opening up at Rosewood Court where Paradise Bakery use to be. You'll see construction already going on. oh yes, I'm looking forward to the new FC too, but I'm guessing Mixt will open sooner. I just joined the WeWork on McKinney Avenue (not something I'd typically pay for, but my company is covering my membership, so...) any healthy, fast-casual spot within a 3 minute walk is a big bonus for me. Wasn’t there a Green Market there? Fire in the kitchen earlier today at Zenna downtown. The fire is now out, no one was injured. DART light rail service was briefly closed and subsequently thrown off its schedule. Apparently the DTD Flying Biscuit location opened yesterday. Hours are 7am-3pm Monday-Friday, 7am-4pm Saturday-Sunday. The restaurant made its debut at 3215 Fitzhugh Avenue quietly on purpose, according to owner Greg Katz, who honed his skills at top-notch restaurants like Sassetta and New York City’s Il Mulino. “We’ve been trying to keep it quiet so we can work on execution and service,” he says. “The neighborhood has already been incredible, and people have been pouring in.” That could have something to do with the restaurant’s chef, former Mirador exec Josh Sutcliff. Quite a drastic change for this area, but seeing as how this is smack dab in the middle of Knox and West Village, it was really only a matter of time. Very cool. Some good talent behind this one! Yea this area in between West Village and Knox has been quite the dry spot, aside from Komali & Salum. Nice to see something else go into it and helping (in a small way) to bridge two pockets of density/interest. itsjrd1964 wrote: Apparently the DTD Flying Biscuit location opened yesterday. Hours are 7am-3pm Monday-Friday, 7am-4pm Saturday-Sunday. Went here last week for lunch and the service was atrocious. I'll still come back because food was generally good but man, no clue how this will survive. Hopefully the service is only bad because the place is new. But with a new market, and the brand's popularity at home, they really need to get with it. Circo Beach is set to officially open at the end of the month, bringing two pools and an actual beach to the gigantic restaurant at 2619 McKinney Avenue, according to a press release. The forthcoming space is upstairs from the dining room at Circo, and will offer everything from spa services and private cabanas to swimming in glass-bottomed pools and cocktails. Like the rest of Circo, the design is completely over-the-top, complete with a 65,000 pound chandelier that hangs over the spiral staircase that leads to Circo. As if this place wasn't ridiculous enough already, now they are adding a 'beach'? I'm not sure where this beach is supposed to go, as the space didn't look all that big from what I saw. This just seems like a last ditch effort to try and get some attention. Maybe I'm wrong, maybe they have been successful so far. I'm rarely around this area, but it doesn't seem like it's all that popular. Last edited by DPatel304 on 12 Mar 2019 11:24, edited 1 time in total. itsjrd1964 wrote: Hopefully the service is only bad because the place is new. But with a new market, and the brand's popularity at home, they really need to get with it. We had brunch there on Saturday and it was fine. I'm sure they'll figure it out and get in the groove. We should be happy to have something other than high-end that's open on the weekends. It's very good to finally have more weekend choice. Hopefully their success will lead to more places locating in DTD. A buzzy new food market from Chicago is coming to Dallas. Called Foxtrot, it's a combination market/cafe/on-demand delivery service and will open its first Dallas location in Uptown. This marks Foxtrot’s first market outside of Chicago. 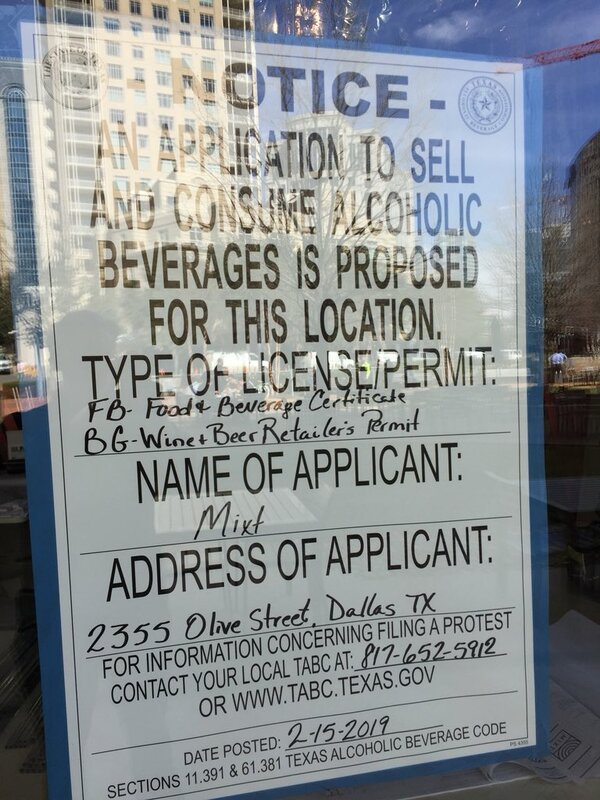 According to a release, it will open on McKinney Avenue in the space previously occupied by McKinney Avenue Tavern, with a date set for summer 2019. A second storefront, address still TBA, is slated to open early summer, followed by the opening of a third storefront by the end of the year. I've never heard of this, but it sounds like it will be a great addition to the area, the former MAT spot will be a great location for it. Surprisingly the article mentions that there will be a second and third location before the end of the year, which is pretty aggressive for a new brand in the area, but I definitely welcome it.